Houses & Homes VA: Death, Taxes and the Ever Rising Utility Bill! Death, Taxes and the Ever Rising Utility Bill! There isn’t much that we can do about the first two but today more than ever there are viable alternatives for supplying power to our homes. Renewable energy sources are becoming more and more popular and although most people still rely on the local power company many are supplementing their power requirements by installing and using their very own power sources. Here are the four most popular and increasingly affordable sources of self provided power. Using solar panels to generate power is nothing new but recent improvements in technology have made this particular technology more affordable than ever. 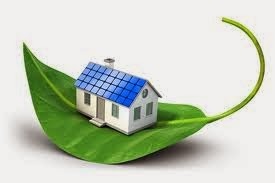 Although most homes require more electricity than a modest sized array of solar panels can provide homeowners can experience a substantial reduction in their electric bill with a fairly modest investment. Using solar energy is as “green” as it gets and surplus power can be stored in batteries to be used when needed. It’s also nice to know that in the event of a power failure you do have at least some backup power to keep the essentials going until power has returned. A less well known but none the less very good choice for home energy is the use of the wind. A wind turbine can provide free energy in the right location with one drawback. It’s best to have this type of technology installed by a professional but if you live in an area with at least a reasonable amount of breeze this is well worth checking out. As with solar panels you probably won’t get completely off the grid but you can save substantially every month on your utility bill. Aside from the traditional solar panels used to create electricity there is another use for them that is fit for any home. Solar water heaters differ from traditional solar panel systems because they are used only to heat water within the home and not to produce usable electricity for other purposes. Over the course of a year that can add up to quite a bit of savings and best of all the cost is comparable to that of a new standard water heater! With savings estimated to be as much as 80% as compared to traditional water heaters this is an investment that everyone should check out! Although less popular than producing your own electricity some people actually use rain barrels to store water as a means of cutting costs on the water bill each month. Admittedly you won’t see this very often within city limits but if you have a large lawn to water or depend on a private water source saving rain water is a great way to reduce your usage and keep your landscaping green and beautiful!